So yeah, I'm guesting on #ukmgchat this coming Thursday. 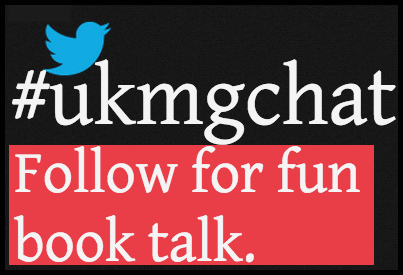 #ukmgchat is a Twitter discussion group that chats under the hashtag every second and fourth Wednesday of the month. EXCEPT my guest appearance is on a !!!Thursday!!! just to confuse everyone. I only know how to write the ones I'm working on! "@authorontheedge: @kieraobrien @candygourlay dual narratives are tricky things #ukmgchat"
Miriam replied cheerfully. "You've written two books that are both dual narrative in different ways." Miriam was unfazed: "And then outside of that, you've read zillions of books that use various different narrative viewpoints, and you will have your opinions on what works and why." Miriam continued: "And you've had the experience of seeing how all sorts of different kids have interpreted and reacted to the dual narrative element in your books." Hmm that Miriam sure is wise. I agreed to do it and now that I've gone through that door of no return, I thought I'd ruminate in anticipation. Because it obviously needs it. I wrote Tall Story in Dual Narrative because it was OBVIOUS that the story needed a dual narrative. Tall Story has two heroes telling two separate stories that come together and their stories are co-equal. It has two settings and it's a culture clash story - what better way to show a culture clash than to hear the clashing voices of the protagonists. Because you're juxtaposing different versions of the heroine. 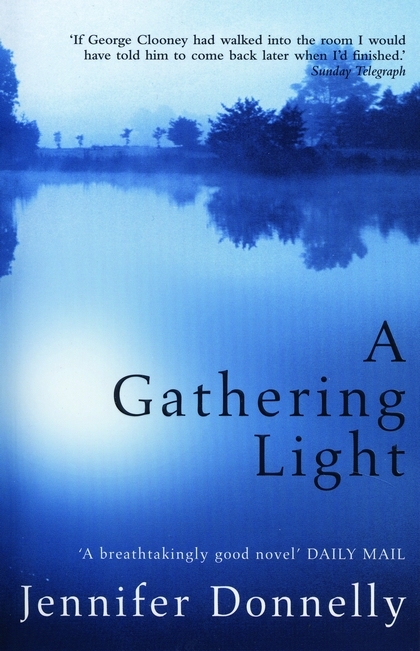 One of the books that inspired me to write novels is the Carnegie winning A Gathering Light by Jennifer Donnelly (It's called Northern Light in the United States). There is only one voice, that of Mattie Gokie, an impoverished1906 teenager who must choose between marriage and pursuing her dream to become a writer. But the story alternates between an earlier Mattie, struggling to look after her family, and Mattie, just a few months later, after she gets a job. One thread is in past tense and the other in present tense. It makes for an intriguing story! Because you're juxtaposing two worlds. 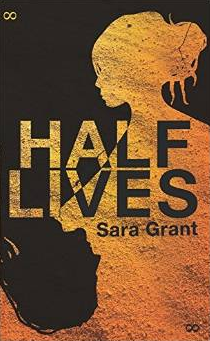 Half Lives by Sara Grant is one of those thrillers that keep you up late at night. Two stories interweave: one set in the past - the story of a group of teenagers who take shelter inside a mountain while apocalypse destroys the world outside. And the other set in the future - the setting is recognisable, but the world is transformed. The deliciousness of this novel is the slow trickle of evidence from the story set in the past that gives you endless aha moments. Because the backstory is taking over the main story. Sigh. This happened to me. Shine was really meant to be told only in one voice. But one of the minor characters kept trying to take over the story. I tried desperately get rid of her (Kill your darlings!) -- but she was so strong, so compelling, that even my editors wouldn't let me chop her out of the story. In the end, my editor Bella Pearson came back from maternity leave and sensibly suggested that I give her a share of the spotlight. Which is why Shine has a subplot told in the second person point of view (!) and at first there doesn't seem to be a connection but it all comes together in the end. Because inside their heads is where the story is happening. 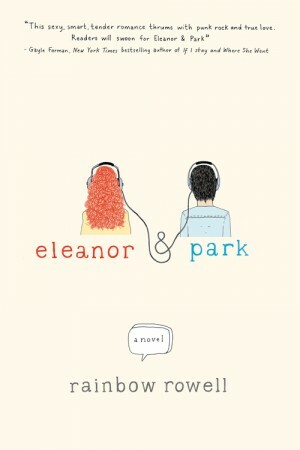 Take the wonderful Eleanor & Park by Rainbow Rowell, a lot of the action between the two characters happens in the same space, but it's what their thinking that drives the story. Getting inside their heads is what we the reader want to do, and the dual viewpoint intensifies our emotional engagement with Eleanor and Park of the title. Because you don't want to report a really juicy story, you want to tell it in the moment. 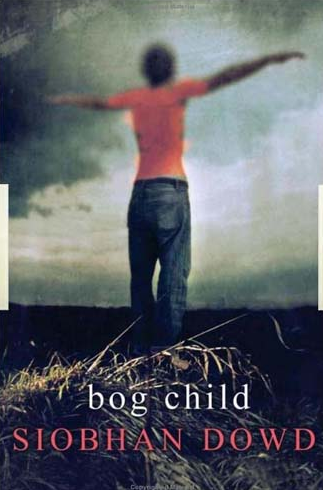 Bog Child, Siobhan Dowd's post humous Carnegie winning novel, is set during the Troubles in Northern Ireland. 18 year old Fergus is struggling with exams when his brother, in prison, goes on hunger strike. While Fergus' troubles are going on, archaeologists find the preserved body of child dating back from AD 80 in a bog. Siobhan could have easily chosen to report the story of the bog body but why do that and bore the reader? Instead the story of the bog child is revealed in Fergus' dreams, made all the more dark and emotional by being properly dramatised on the page. Because switching perspective saves all the exposition in the world. 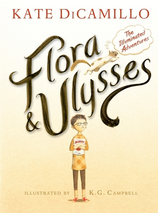 I use the word delicious a lot when I talk about books and there is no more delicious and delectable book than Flora and Ulysses by Katie DiCamillo. The entire book is written in third person, but the viewpoints switch between Flora, who admits that 'For a cynic, I am a very helpful person'. The other viewpoint is that of Ulysses, a squirrel named after a vacuum cleaner who emerges from brain damage with super powers and extreme joy. 'It was astonishing,' he thinks after waking up from his accident, 'Everything was astonishing. The setting was illuminating each blade of grass.' You could write this in a different way - you could explain that Flora thinks she is a cynic but doesn't act like one, and you could describe how the squirrel's brain began to think in a different way after his accident. But why bore your reader? Why not make your reader experience what it's like to be in the head of a superhero squirrel? One thing that had not occurred to me, as a children's author, was that child readers might struggle to get to grips with a dual narrative. Adding that extra storyline to Shine for example, bumped it up to young adult (not just because of the dual narrative but because the subplot had an adult sensibility). Indeed, visiting Year 6 school children (10 and 11 years old) recently, I found plenty of readers who had no problem with switching between voices -- who enjoyed the contrast and the story structure. And I also found readers who struggled with it, finding the changing voices confusing. Thank goodness for teacher enthusiasm, these readers got it in the end. 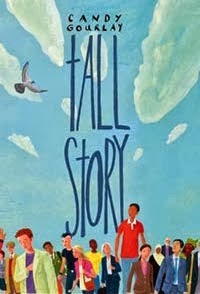 I lent the schools audiobooks of Tall Story, which seemed to help. I love the challenge of the dual viewpoint. I love telling two stories at the same time, through two different voices, and then watching the separate strands interact and surprise, one revealing surprises about the other until they melt into a single delicious whole. But be warned, if you're a pantser (a writer who doesn't plan or who plans very little), you will have to put on some y-fronts once in a while to make this dual narrative thing work. The magic (and the fun) is in plotting out the arcs of the two stories so that their peaks and troughs interact in an exciting way. The climax of a dual narrative would involve a collision between the two stories - great fun once you figure out how to do it! And of course you will have not one but TWO endings that must leave your reader feeling satisfied and yet loathe to let go. If you'd like to share your own writing experiences with dual narrative, or a favourite dual narrative book, join us on #UKMGchat, Thursday, 9 April, on Twitter, 8 to 9 pm GMT. How to join? Read this. If you liked this, you might enjoy my post How We Live Now, looking back on changes to the children's book world since I started trying to get published. Read it in my blog on writing Notes from the Slushpile. Great post Candy and timely too - I am reading Elizabeth is Missing and it has a dual narrative too - the older woman's younger self. I'm busily editing a dual narrative YA novel right now, and anxiously scanned your list to make sure I fit into a category (I do! I do! - because inside their heads is where the story is happening). I was nervous of having two POV to begin with. But it was also so much fun, in ways I didn't expect. Jumping into different heads gives way of moving through the story that don't exist with one POV. For example, it's great for having stuff happen to one character off scene while we're with the other character, which is perfect for an unreliable narrator. Oooh excited to hear you're writing a dual narrative! I agree ... there are many tantalizing things you can do with your unreliable narrators. Look at Code Name Verity by Elizabeth Wein, with one character narrating half of the book only to have a second character unravel the first's version of the truth. Who do you believe? It's a double bluff. Readers love having the wool pulled over their eyes! You're right about the planning required - that may be why I'm a single narrative type of writer. Sara Grant told me that she planned Half Lives in great detail first, then wrote each half of the book as a self-contained novel, before weaving them together at the editing stage. Worth all that effort, I'd say! Well I loved Half Lives. Really admire Sara's work there. I say dual narratives are fun ... but I admit there were many moments when I questioned the wisdom of making life harder for myself! My book 'What they don't tell you about love in the movies' started out with a single first person narrator, but, as it's about the fact that you never really know what's going on in someone else's head, it was crying out for a second narrator. Thanks Candy - all my attempts so far have been single narrative - haven't really felt like writing for a few months but when i do again I'm sorely tempted by more than one POV and this is really helpful. You're welcome, Jan. It's great fun ... it's important to let the story decide if it needs a dual viewpoint. Good luck! I was searching in google blogs those have good content on writing and just found candygoulay blog. It seems to have great quality content to read.